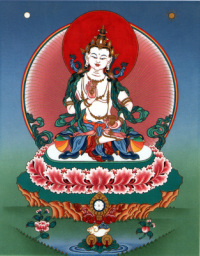 Vajrasattva is the manifestation of the purity of body, speech and mind of all the Buddhas. The practice of Vajrasattva is especially effective for purifying negative karmic imprints created by the ten non-virtuous actions and transgressions of precepts, vows and commitments. By applying the Four Opponent Powers, this practice can help to purify our negative actions and alleviate guilt, remorse and feelings of unworthiness that keep us from going forward in our lives. No matter how black with dirt a cloth is, because it is not one with the dirt, it can always be cleaned. No matter how thick the dust on a mirror is, the mirror can always be cleaned. Like this, no matter how strong our delusions and how heavy the negative karma we have created, since our mind is not one with them, there is always hope; there is always the potential for our mind to be separated from these obscurations and become completely pure. You can be free from fear, guilt, and all other undesirable emotions. Your mind can become completely free from all faults and perfected in all realizations; your mind can become a fully enlightened mind, a buddha’s mind.